Riding your bicycle in the Florida Keys is one of the best ways to see the islands and get to know the landscape personally rather than zipping past in a car. It’s also the best way to have a really bad, hot day in the sun if you don’t plan your cycling carefully and do a little research first. 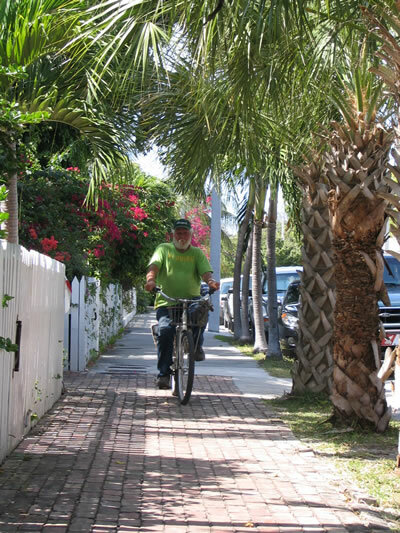 If you are headed for Key West for your vacation, then renting a bicycle is probably something you’ll want to do, just to get around. Key West is made of tiny narrow streets jammed with SUVs, trolley tours, maniac scooters, and endless traffic, it sometimes seems. Add to the mixture a series of one-way streets and you get total frustration for the visiting driver. There are way too many cars for this tiny island, which is only four miles long. Driving is not only frustrating but it’s not even necessarily the fastest way to get from point A to point B. Once you finally make it to your destination, you have an even greater hurdle to clear: parking. Parking is rare, difficult, and expensive in Key West and some Inns and resorts in Old Town don’t even have parking for their own paying guests! 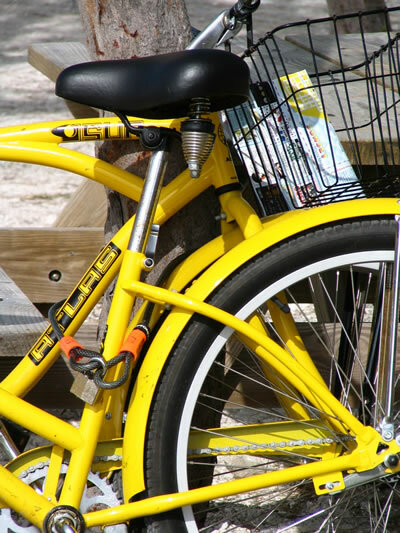 Renting a bicycle to get around Key West is one of the smartest things you can do for yourself to relieve aggravation while on vacation. There are bike racks everywhere, even at the supermarket, and drivers are courteous, for the most part. Some roads in town have bicycle lanes so ask your rental agent for a map showing which roads have these lanes. Most of the bicycle rental companies in town rent out cool beach cruisers, which are very comfortable and fun to pedal. They have baskets for your belongings, and they’ll give you a lock, of course. Some will bring the bicycle to where you’re staying, and lots of resorts have bicycle rentals on the premises. Otherwise, look for signs along North Roosevelt Drive, or all around Old Town. 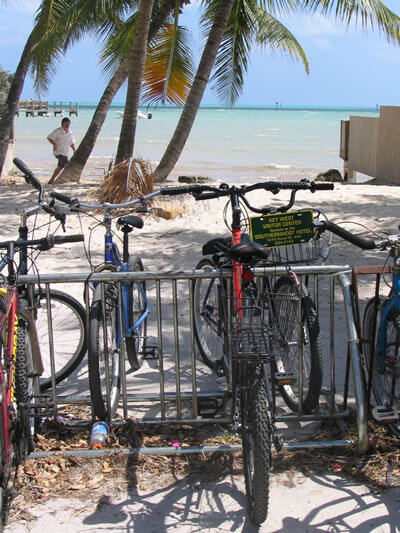 There are bicycle trails all along the various Florida Keys, from Key Largo to Key West, but you have to know about most of them in order to find them. One of the best is on Big Pine Key, off Highway One. There are trails alongside the road through the National Key Deer Refuge, and you’ll love riding through scrubby pine forests watching for the endangered tiny Key Deer. Big Pine Key is thirty miles from Key West. 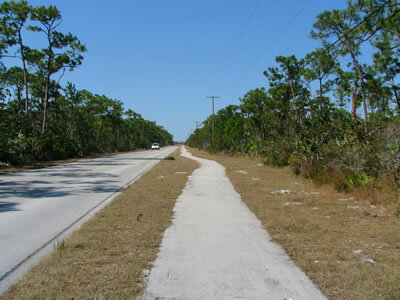 At Mile Marker 17, on Sugarloaf Key, there’s a bike path on Sugarloaf Road in a residential area. The path, if taken round trip from the Sugarloaf Lodge (where you can park), is fifteen miles long. At Mile Marker 19.5, also on Sugarloaf Key, there’s another paved bike path on Crange Boulevard, bayside. It goes all the way to the bay. Middle Torch and Big Torch Keys, at Mile Marker 27.8, have a natural area with a bike path that’s 15.5 miles long if you take it round trip from just off U.S. 1 on Middle Torch Road. This road actually has bends in it! There are some crazies out there who like to bicycle throughout the Keys, making a long-haul trip out of it, some sort of endurance thing. This is not for the faint-of-heart or the uninitiated, either, since U.S. 1, otherwise known as the Overseas Highway, has little or almost no shoulder! With hardly any shoulder in many stretches of the only road through the Keys, and with the crazy, bad drivers and the congested roads, this doesn’t seem like a pleasant way to bicycle in the Florida Keys, but people do it.